So…before you fake boxing news gurus think you clicked on this article to read that Errol Spence was injured in his victory over Lamont Peterson, it’s not that. And if you’re some “has been” boxing website owner named after a 60’s haircut, there is no hard news here for you to wonder why you didn’t get it first. This is merely my take on what transpired this weekend in Brooklyn. And a bit more. First let me tell you that both Errol Spence Jr. and Lamont Peterson are stand up guys who take their professions seriously. The problem is that this fight ever took place. Spence is in the prime of his possibly Hall of Fame career. On the flip side Peterson is well into the deepest darkest twilight of his once fine career. All credit for him to hanging in there with Spence for as long as he did but be honest with yourselves here, this fight was over before the ink was dry on the contract they signed to fight. If Spence for one second thinks he did himself any favors with this one-sided beat down of Peterson he is gravely mistaken. 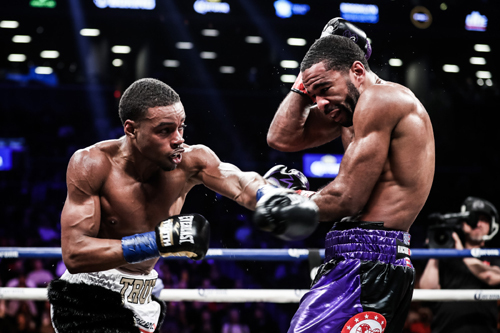 Boxing insiders saw what went down on Saturday night and although there is no questions among them that Spence is the real deal, it’s clear he was in there against a very shop worn opponent. At the end of the day the only positive to come out of this fight for Spence is that it kept him active. After that it was another in the long line of meaningless charades put on by the ever scrutinized PBC. All Spence has to do is take a look at Danny Garcia to know and understand that fights like this are one step forward and two steps back. No matter how you slice it that is a career that is going in reverse. You can argue with me on that point all you want but look at where Garcia is now. Danny will be taking on a long in the tooth Brandon Rios in a fight that literally no one cares about. Think about it. If Garcia doesn’t go out and whitewash Rios inside of one minute of the first round this fight will set him back even further than he is now. And thanks to the promotional genius of “you know who”, Garcia is all but a forgotten commodity. If by some chance Rios should stretch Garcia into the mid rounds before succumbing to Father Time you can pretty much write Garcia’s off. Even a decision by Garcia or heaven forbid a loss will thrust him into boxings Never Never Land, we will never see him again. Spence might want to think long and hard about his next opponent before he falls by the wayside like Garcia. And yes, I am aware Spence is supposed to be fighting Keith Thurman next but as we know Thurman has been inactive for almost a year, (another staple of PBC promoted fighters), so who knows if he will take a stay busy fight with the likes of Jessie Vargas, (ahem), or if he will just show up full of ring rust against Spence. I digress…Before you say that can never happen may I direct your attention to one Adonis “Superman” Stevenson. You might remember him. Stevenson won the Light Heavyweight title in stunning one round KO fashion over Chad Dawson back in 2013. All indications where he was on his way to Super Stardom. Soon thereafter Superman was picked up by PBC and Superman’s career was promptly hit with a fistful of Kryptonite. Stevenson’s activity went as south as did his opponents. While ducking every worthy challenger at 175 pounds Adonis has become a pariah. No one in his adopted home of Montreal cares about him, he allegedly can’t travel to the USA to fight and like the rest of his stable, Adonis has been put on the shelf by his Advisor/Promoter and instead of grabbing the rest of the 175 pound belts all he is collecting is dust. Again, this should not be news to Spence. The writing is clearly on the wall here. I reiterate, fighting Peterson did him no favors at all. Spence is a way too talented and gifted a talent for a fighter who hasn’t fought in over a year and that’s exactly who Thurman will be if he is next on Errol’s agenda. That’s just not good enough. You all remember Keith Thurman, correct? Two years ago in an interview on Pound4Pound.com Showtimes Al Bernstein suggested Thurman was the heir apparent to fill the shoes of Floyd Mayweather. Since then Thurman’s activity rate has him more like being the heir apparent to Claude Rains. (You youngsters will have to Google that one to catch my drift). If Spence wants to prove he is worth his weight in gold he needs to not only call out to Terrance “Bud” Crawford but then he must demand that his promoter/advisor make it happen….NO EXCUSES. Making money on boxing should be a snap for Spence. Many many monies. But if he allows his career to go the route of Garcia, Stevenson, Thurman and the like he will find his bank account will fall far short of the lofty goals he and his team have in mind. A lot of these problems could be alleviated if all these second-tier promoters would stop being Haymon’s personal hand puppet by allowing him to smoke and mirror the public with these dog and pony show under the radar promotions. That would be Michel, Brown, DiBella, Margules and more if you are looking for names. I used to call them Marionettes, but I think hand puppet more accurately describes the roll of these do anything for a buck carnival barkers. At the present time the lead hand puppet is none other than Richard “Faust” Schaefer. You might remember him. The only thing greasier and dirtier than his hair and that one tattered suit he wears to every press conference is the way he has conducted his boxing business over the past decade. In recent interviews the head of his company Ring Star Promotions has wondered aloud why his “World Series Whatever It Is” can’t get any play stateside. C’mon Richard, you are not a stupid man. Aren’t you the guy who used to introduce Oscar De La Hoya as not only your business partner but best friend as well? And wasn’t it sometime later you unceremoniously stabbed him in the back. It’s really no wonder why the networks don’t want to touch you with a ten-foot pole…is it? For guys like Spence it’s going to be an uphill battle to get to the place he aspires to be, that being one of the top Pound4Pound fighters in the world as recognized by the real boxing public. Maybe guys like Spence should follow Danny Jacobs example and find a way to get out from under the PBC and the team of hand puppets. In the end that might be his wisest move. And lastly, while I am on a roll…lately a new breed of boxing media members has appeared on the scene. The Supremely self-entitled journalists have rubbed most of the old school scribes the wrong way. It’s just a matter of time before the proverbial crap hits the fan. Getting credentialed as the Team Photographer while others more deserving are getting downgraded is not going to serve you well in the long run. A lot of us made our bones while you were still standing outside the arena hoping to get an autograph after the fights conclusion. Just pay your dues like the rest of us and everything else will fall into place. This entry was posted on Tuesday, January 23rd, 2018 at 1:24 am	and is filed under Boxing. You can follow any responses to this entry through the RSS 2.0 feed. Both comments and pings are currently closed.